"Like" token, awarded by mmodell. Cf. T99849. It's not clear what to do about such notices found in the logs, maybe a stacktrace or clearer message is needed. T154427: ErrorException with "PHP Notice: JobQueueGroup::__destruct: 1 buffered job ... HTMLCacheUpdateJob never inserted"
All three bugs are related to jobs (background tasks managed asynchronously) and deferred updates (also called deferrable updates, tasks postponed to the end of the request). Some deferred updates can be transformed to jobs. Jobs are usually pushed in the job queue during normal operations, but some jobs are only pushed at a latter time, these are called lazy jobs (short for lazily-pushed jobs). At the end of a MediaWiki request on the Web, deferred updates are executed, then some jobs are executed if the parameter $wgJobRunRate is not 0, and lazy jobs are pushed to the job queue. T165714 (duplicates: T154439) (affects: MW 1.28, 1.29, 1.30) Some jobs throw an exception when executed on the Web due to interactions between jobs and deferred updates linked to database transactions; these jobs are never executed and remain in the job queue until deleted. Bug trigerred when $wgJobRunRate > 0 (default) and the job queue is JobQueueDB (default). Fixed by https://gerrit.wikimedia.org/r/#/c/356120/ on 1.28, 1.29, 1.30. 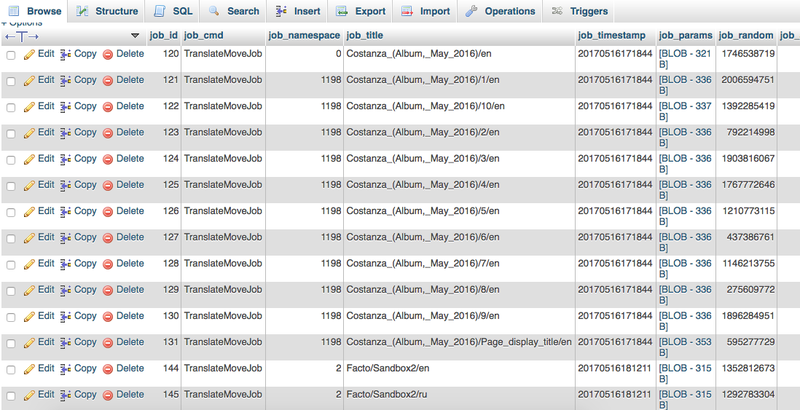 T100085 (duplicates: T154427) (affects: MW: 1.27, 1.28, 1.29, 1.30) Some lazy jobs added by jobs executed on the Web are not pushed and this triggers an error in the logs; these jobs are never added in the job queue, hence never executed. Bug trigerred when $wgJobRunRate > 0 (default). Fixed by https://gerrit.wikimedia.org/r/#/c/356120/ on 1.27, 1.28, 1.29, 1.30. The fix from T154425 improves the resolution. Possibly other root causes given it happened on Translatewiki and Wikimedia (where $wgJobRunRate is 0). T154425 (duplicates: T154438, T157679, T166867, T153849) (affects: MW 1.28, 1.29, 1.30) Some deferred updates are not executed when there exists an EnqueueableDataUpdate (a specific deferrable update, which can be transformed to a job) linked to database transactions; this happens mainly during delete, restore, move operations, possibly some others; these deferred updates are not executed. Bug trigerred when the job queue is JobQueueDB (default). Fixed by https://gerrit.wikimedia.org/r/#/c/356619/ and https://gerrit.wikimedia.org/r/#/c/357966/ in 1.28, 1.29, 1.30. T154425: Delete action throws a DBUnexpectedError with "MWCallableUpdate::doUpdate: Cannot flush snapshot because writes are pending (JobQueueDB::doBatchPush)"
T166867: DBUnexpectedError from line 2877 of Database.php: MWCallableUpdate::doUpdate: Cannot flush snapshot because writes are pending (JobQueueDB::doBatchPush). ashley added subscribers: lcawte, ashley. Going to be bold and reopen this. Ever since we upgraded ShoutWiki to MW 1.28 last December we've seen plenty of these errors, which manifest as RC entries which shouldn't be there (T153849/T154425). Because the jobs don't get inserted, the RC rows don't get deleted...but the big question here is "why?". I've been trying to track down this issue ever since the upgrade, so any and all pointers are more than welcome. Related (if not the same): T154427: ErrorException with "PHP Notice: JobQueueGroup::__destruct: 1 buffered job ... HTMLCacheUpdateJob never inserted"
Krinkle merged a task: T154427: ErrorException with "PHP Notice: JobQueueGroup::__destruct: 1 buffered job ... HTMLCacheUpdateJob never inserted". Krinkle added subscribers: mwjames, LIMAFOX76, Kghbln. Gilles moved this task from Inbox to Next in FY1819Q3 (Jan-Mar)	on the Performance-Team board. PHP Notice: JobQueueGroup::__destruct: 5 buffered job(s) of type(s) CategoryMembershipChangeJob, CdnPurgeJob, RecentChangesUpdateJob, HTMLCacheUpdateJob never inserted. PHP Notice: JobQueueGroup::__destruct: 6 buffered job(s) of type(s) EnqueueJob, CategoryMembershipChangeJob, CdnPurgeJob, RecentChangesUpdateJob, HTMLCacheUpdateJob never inserted. PHP Notice: JobQueueGroup::__destruct: 6 buffered job(s) of type(s) CategoryMembershipChangeJob, CdnPurgeJob, RecentChangesUpdateJob, EnotifNotifyJob, HTMLCacheUpdateJob never inserted. PHP Notice: JobQueueGroup::__destruct: 7 buffered job(s) of type(s) EnqueueJob, CategoryMembershipChangeJob, CdnPurgeJob, RecentChangesUpdateJob, EnotifNotifyJob, HTMLCacheUpdateJob never inserted. Krinkle moved this task from Resolved to Found during 1.33-wmf.14 on the Wikimedia-production-error board. I am the taker of these screenshots, and I must mention I only started having this issue after upgrading from MW 1.26 to 1.28.2. The bug has prevented me from moving pages that have been marked for translation (through Extension:Translate), the site renaming the core page but freezing up at any of the subpages. I can verify that moving a page that has not been marked functions as one would expect. I have yet to experiment with runJobs.php, but I can provide whatever extra info I have that is necessary for a solution. This isn't being caused by MassMessage. So basically if an exception is thrown so the MediaWiki::doPostOutputShutdown() call isn't reached, the jobs get discarded. What is the expected behavior here? Try to submit the jobs anyways? Or treat it like a db rollback and discard the not-submitted jobs? I would say the expected behavior is that no exceptions get thrown :D How can we find out what those exceptions are and fix them? I'm not sure, shouldn't exceptions be going to the normal exception log? I assume they are, aren't they? The reason this notice ends up being logged isn't because the exception is non-fatal, but because it gets logged from a native shutdown or destruct handler, which can run even after the exception has been dealt with. This bug should only happen if the exception is left uncaught until a very high level handler (probably OutputPage::output or MediaWiki.php or some such). At that point, we cannot decide to rollback everything (since it's not a DB exception, which we handle more explicitly), and also should not decide to insert them (since something clearly went wrong). Aborting mid-way is the correct behaviour. Any DB consistency should already be taken care of by other logic. The notice represents the truth: A job was queued, but execution was aborted before it could be inserted with confidence. The right solution is to either 1) Fix the exception, or 2) If the exception is genuine, handle it property by catching it. In addition, it may be appropiate to, if a try/catch is added, to move the job queue insertion to outside that block (before or after it). [21:21:25] <legoktm> AaronSchulz: thoughts ^ ? [21:26:20] <AaronSchulz> looks like callers that want rollback() already use onTransactionIdle() and the method does not mention rollback. [21:26:40] <AaronSchulz> I'd suggest making the exception handler try to push them and clarifying the docs for lazyPush(). [21:42:27] <AaronSchulz> legoktm: where you thinking of patching? [21:45:02] <legoktm> relatedly, deferredupdates that get queued but don't run because of an exception also get silently dropped I assume? I think having the exception handler attempt to push them seems reasonable. I’m not sure the root cause of this bug is the same for everybody reporting here, because there two very different cases: $wgJobRunRate = 0 and $wgJobRunRate > 0, and given the situation changed with the Gerrit change 212485.
and one of the above resolution path for JobQueueGroup should be chosen; I tested the second resolution path (add a second JobQueueGroup::pushLazyJobs() after the second DeferredUpdates::doUpdates( 'enqueue' )) and there are no more JobQueueGroup::__destruct warnings (solving this bug), but I’m not sure if it will solve all situations, possibly one of the above resolution path should be done (instead or in addition). (*) to wiki administrator reporting this bug here: please say the value of $wgJobRunRate, particularly if it is zero, and the exact list of extensions you are using. All my wikis have $wgJobRunRate = 0. That probably explains why I have not been seeing this error message myself recently. It has been zero for a long long time, so I find it unlikely. @ all: should be fixed in standard conditions for temperature and pressure in master version of MediaWiki. Could you test/verify if you still see this error? – I’m a bit afraid since Translatewiki has no Web-executed jobs, so no sure the patch will fix all cases. Cherry-picked to REL1_29. I guess it should be backported to REL1_27 and REL1_28, but I’m not sure. Will check later, except if someone is quicker. Thanks a lot @Seb35 for your effort tackling this issue! I only use cron to work on my job queue so I am not the best tester for client triggerd executions. I believe this fix should be backported to REL1_27 and REL1_28. Backported to 1.28, which is very similar to 1.29 in this area -- I was able to reproduce the same behaviour with Translate. However it’s more different for 1.27 since it seems to work: Translate jobs are executed through the Web interface. Hence the task T165714 seems to be non-existant on 1.27 but this task T100085 is still experienced -- in this, it was not a so great idea to solve both bugs with the same gerrit patch. I will prepare a specific gerrit patch for 1.27. Seb35 mentioned this in T154438: Special:MovePage throws MWCallableUpdate::doUpdate: Cannot flush snapshot because writes are pending (JobQueueDB::doBatchPush, JobQueueDB::doBatchPush). Krinkle added a commit: rMWd80fca05e18d: Better handling of jobs execution in post-connection shutdown. Resolved in 1.27-1.30 (see summary in description for an overview of the two similar bugs). @aaron I added some documentation on Manual:Job queue and Manual:Job queue/For developers; could you review it and particularly the differences between deferrable updates and jobs? It should help developers to decide if they want to use a deferrable update and/or a job.